In fact, I thought of a book I read a long time ago by Ray Kurzweil, called The Age of Spiritual Machines. In this book, written in 2000, he made predictions about technology at the end of each decade for the next several decades. The one that stuck with me, perhaps the most, was that, by 2020, humans would be developing “relationships with automated personalities.” Alexa isn’t that, per se, but here in 2016, she’s the first time I’ve looked at that prediction and thought, “by 2020… I could see it.” After all, that’s 4 years of Amazon pumping her full of ever-more Easter egg question responses as well as building her framework for informational answers. Right now, it’s like having a savant in the room, but, by 2020, it may be like having an off-color but likable human in the room. But what is it that makes Alexa subtly different from Cortana and Siri. I’ve already mentioned that the nature of Alexa sort of forces me to stick it out with her in a way that I don’t have to with these other automated personalities, but it’s more than that, and it’s more foundational. Alexa (voluntarily) operates within a constraint that the others pass on. Cortana, Siri and “OK Google” are all window dressing/add-ons for devices whose primary purpose is something else, making reverting to what you know comfortable to the point of preferable. 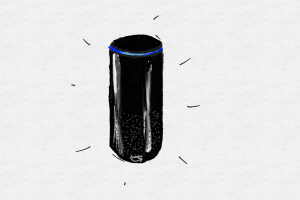 Alexa is an add-on to nothing, so interacting with her is like meeting a new thing/person. If I actually stop and think about it, it’s a pretty bold move to sell a piece of hardware designed to facilitate a virtual relationship. It’s much easier to piggy-back the software onto a device you already have or else one that you might be willing to purchase for its benefits, only one of which is the thrown-in virtual relationship. And it’s recognition of this boldness that brought home to me exactly why this whole thing is so appealing — creative constraints. Imagining the world this way can eat up otherwise terrible minutes during a department meeting. I bet if elevators failed that frequently all of a sudden, a position akin to “coal miner” would emerge to help people fetch valuables out of skyscrapers until such time as everything were relocated to the ground and new buildings were constructed without elevators. And I bet that in a world where brakes stopped below 5 miles per hour, people would have big squishy pads on their garage walls. The result of this exercise might be that you discover a way to relying on hearing or smell to improve navigation, and the newfound skill may continue to help you even after you remove the blindfold. The result may even be that you learn it’s better, for some reason, to walk this obstacle course without being able to see, and you leave the blindfold on. But, beware, because the result may also be that putting on the blindfold turns out to be bad idea. But, whether the outcome is slightly helpful, revolutionary, or a total bust, there’s value in the exercise. Thinking with creative constraints seems like it’d be the inverse of “thinking outside of the box,” but it’s really the same principle. Looking at those 9 dots, the creative constraints thinking would be, “what if we accepted that there are no 4 consecutive lines that can be drawn in these boundaries, but that the puzzle was still solvable?” Applying creative constraints to the complex problems you’re trying to solve will often clarify your thinking, help you decouple and decompose problems, and provide additional focus, all while spurring you toward uncommon solutions that may not occur to others. So let your mind wander a bit. And, even if you never acted on it, ask yourself what life would look like if you shipped a virtual companion for which there was no backup plan. It might lead you to surprising places.